Heading into the unknown, the MOTUL FIM Superbike World Championship prepares to take on Circuito San Juan Villicum for the first time and despite the title being wrapped up in France two weeks ago, there is plenty more to be decided out on track. A brand new circuit brings brand new battles, with Jonathan Rea (Kawasaki Racing Team WorldSBK) out to break more records and the battle for runner-up heating up, there’s a lot to be look out for. 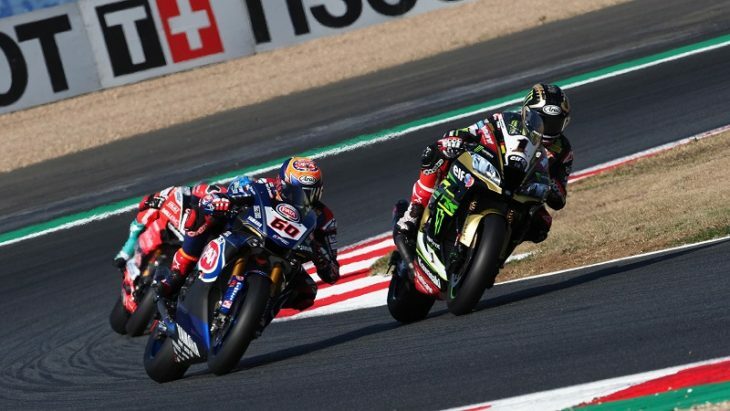 Crowned world champion in France and on a winning streak of eight in a row, Jonathan Rea (Kawasaki Racing Team WorldSBK) won’t be looking to slow down in Argentina. With one eye on the overall points record and another on the overall win record, the Northern Irishman will hope to continue with his sensational pace on the ZX-10RR this season. The last rider to win on a new circuit back in 2015 at Buriram, Rea has a lot of history on his side and surrounded by his close team, there will be no doubt he will be gunning for another piece of history. Still riding injured, Chaz Davies (Aruba.it Racing – Ducati) put on a sensational performance to take a podium last time out in France, pushing through the pain barrier to secure second position after an early race hussle. With even more time to rest before heading to Argentina, the British rider will once again have his eyes on the runner up spot in the championship, and the left handed nature of the new Circuito San Juan Villicum will only play into his hands. If Davies takes a podium finish, he will secure the 888th rostrum finish for Ducati in WorldSBK, or will it be team-mate Marco Melandri (Aruba.it Racing – Ducati) who takes that milestone? Heating up the battle out on track is Michael van der Mark (Pata Yamaha Official WorldSBK Team), as the Dutchman is the man hoping to stop Davies taking the overall runner up spot. Sitting 26 points behind Davies with four races to go and 100 points on the table, van der Mark has his eyes on another victory this season. Taking four podiums from the last five races, the Dutchman is preparing to put up a strong fight into the unknown this weekend. It’s been five months since his debut double at Donington, and it remains to be seen if he can match it. Continuing to struggle with the rear grip issues which Eugene Laverty and his Milwaukee Aprilia team thought they had solved at the mid-point of the season, they will be hoping to end the season on a high. Despite some strong lap times in Superpole, Laverty and his British-based team are still searching for the solution throughout the race. One of the few riders to have raced in Argentina before – at Autodromo Termas de Rio Hondo – and winning the first ever race at Istanbul Park in 2013, the Irishman has a good history at new tracks and will be hoping it will be the same five years on. Leon Camier (Red Bull Honda World Superbike Team) continues to struggle with his CBR1000RR Fireblade SP2, after a tough round last time out in France. With two top 11 finishes around Magny-Cours, the British rider will be hoping to find the pace he had back in Thailand or more recently at the four day Portimao test. Heading into unknown territory of Argentina, the even ground might come as a help not a hinderance to the Red Bull squad, with team-mate Jake Gagne continuing to learn the tracks on the calendar. Fresh off the back of a tough weekend at his home track of Magny-Cours, Loris Baz (GULF ALTHEA BMW Racing Team) took home two top ten finishes as the European season came to a close and will be hoping for improvements in Argentina. Heading to South America on even footing with the rest of the field, the tall Frenchman will be the third rider on the grid who has raced in Argentina before, so the experience won’t fully be a new one. Three new faces will be welcomed onto the WorldSBK grid in Argentina as Maximilian Scheib steps in as a replacement for Jordi Torres at MV Agusta Reparto Corse, whilst Gabriele Ruiu takes on the Team Pedercini Racing Kawasaki in place of Yonny Hernandez and Florian Marino will don the TripleM Honda World Superbike Team leathers, in place of PJ Jacobsen. Scheib is a race winner from the European Superstock 1000 Championship, finishing runner up this season and will be racing on his home continent as he hails from Chile in South America. Whilst 18 year old Ruiu has been impressing in STK1000 with top eight finishes this season, and sticking with the same team he will already be comfortable in his surroundings. Frenchman Marino is a consistent top six finisher in STK1000 and brings vast amounts of experience. Make sure you don’t miss the San Juan debut this weekend as WorldSBK prepares to take to the 4.2km track. Action kicks off at 09:45LT (GMT -3) for Free Practice one on Friday, before the battle for pole begins on Saturday at 13:30 ahead of Race One at the later time of 16:00. Lights go out for Race Two at 16:00.